"Here's to our mothers, who gave us life and still call us "my baby"! Here's to the fallen, who gave their lives for their fellow Americans! As we celebrate and reflect upon those who have given us the most, we honor the greatest aspects of who we are, as family and as country. In this regard, we release Nineteen Anniversary Ale, a Belgian-style Tripel to honor our fondest roots of brewing tradition and those loveable monks and brewers who gave us the inspiration to do what we do and brew what we brew! So let's raise our steins and goblets, tulips and tankards, and give cheers to those who have given us the best! 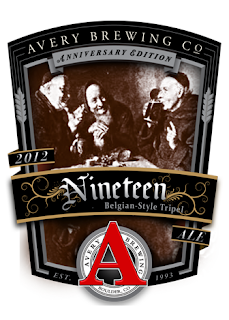 Celebrating nineteen years of brewing could kind of get overlooked what with the big 2-0 coming. But we will never forget 2011! Not only was it our largest growth year ever, but we also began designing our new brewing facility! In excited anticipation of 20 years and the new brewery, we concocted this very traditional, yeast driven, dry and fruity Tripel. Thanks to those folks (you know who you are) who have been such an integral part of our longevity and success! Peace to all and follow your dreams! "